"Love everything about this wonderful place. A little piece of heaven on earth." 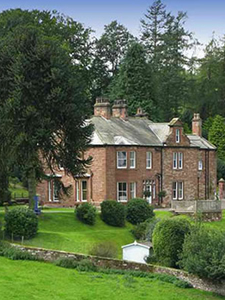 Hawksdale Lodge built circa 1820s, is a beautiful family home. Set in an elevated position in Cumbria, just a ten minute drive from the Lake District, it enjoys spectacular views across to the Northern Pennines and the hills of Dumfriesshire. We offer Bed & Breakfast accommodation as well as self catering holiday accommodation in our newly furnished Apartment, for which we are very proud to have been awarded 4 STARS and a GOLD AWARD from Visit Britain. Hawksdale Lodge: A self catering 2 bed apartment and Luxurious B&B with stunning views, a Rural Retreat set in a great location for exploring The Lakes, The Solway Coast and Hadrians Wall. Lovely breakfasts, homemade cakes, log fires and huge rooms.